Another miso-broth hot pot dish with my beautiful classic-style donabe, "Hakeme". 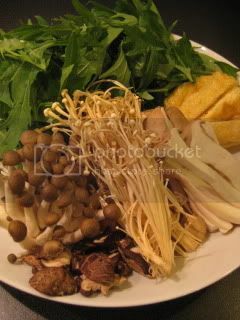 Simple ingredients to cook in the broth...my sun-dried mushrooms, sliced abura-age, mizuna leaves, gin-dara (black cod, seasoned with salt and left for 30 minutes), and soft tofu. For the broth, I first combined 3 cups water, 1/4 cup sake, 1 tablespoon mirin, and 2 pieces of 2"x2" size dashi kombu (dry kelp) and let the kelp soak in the liquid for 1 hour (at least 30 minutes is okay). Then, dissolved 2 tablespoons saikyo-miso (sweet white miso), and 3 tablespoons our homemade dark miso in the liquid. 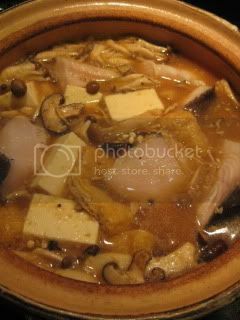 Mushrooms and abura-age were added and brought to simmer (slowly) over medium-low heat. 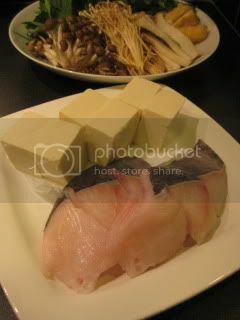 Once the broth starts simmering, kombu was removed and fish and tofu were added. 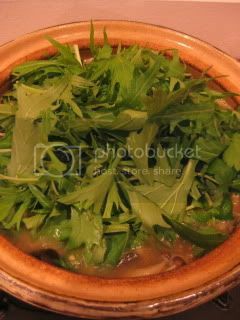 When the fish was cooked through, some sliced yuzu rind, cut mizuna leaves, and mitsuba leaves were added and cooked for additional 1-2 minutes. The dish was ready. 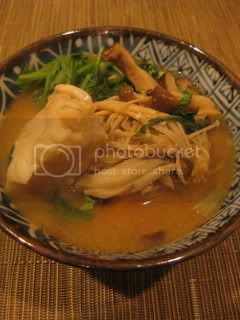 The broth was amazing with the infused sun-dry mushrooms and black cod. Great dish. After eating most of the ingredients cooked in the broth. I added dry ramen noodle for "shime" (end of the meal) course and cooked for a few minutes. Mmm...the noodles soaked all the deep flavors from the broth and it was fantastic. 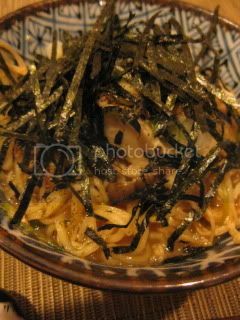 I served it with a lot of shredded nori seaweed and sliced scallions.